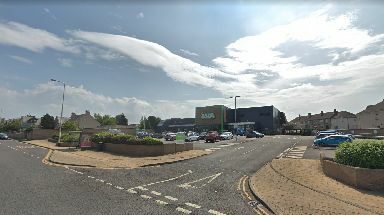 Four teenagers attacked the girl near a supermarket in Tranent. They are described as around 16 and all wearing hooded tops. Detective constable Mandy Cummings said: "There was no interaction between the teenagers and the victim beforehand so this is believed to have been opportunistic and potentially thought of as a prank by those involved. "However, this behaviour is absolutely unacceptable and this incident is being treated as an assault. "Thankfully, the girl was uninjured but this understandably caused concern and upset to her and her family. "Anyone who may have seen the teenagers in the area, or who has any information about this incident, is urged to come forward and report this." Anyone with information can call Police Scotland on 101.